Last Updated: June 25, 2015 | Subscribe to our weekly newsletter! Like any good hot tub owner, you probably spend a good deal of time making sure your hot tub is as clean as it possibly can be. Just looking at your hot tub, you can see how clean the bottom and sides are and how crystal clear the water is. But what about the parts you can’t see? In these hard to reach and see areas is where everything can begin to collect that result in stinky smells, cloudy water and scum lines around your tub. When these get inside your hot tub, they can begin to dirty up your filters preventing them from doing their job causing your water quality to suffer and, in extreme cases, can even produce some rather unpleasant odors. Every year, you should take a few moments to perform a hot tub deep clean to eliminate this buildup both inside and out. This will help you make sure your hot tub remains clean not only on the outside, but the inside as well, giving you months of fresh bathing that you can enjoy all year round. If any one of these sounds like your hot tub, it is probably a good idea to go ahead and give it a deep clean whether it is time for its yearly cleaning or not. Before you perform the deep clean, be sure to remove any large debris that may be in the water so it doesn’t accidentally get into the pumps or clog your filter. The night before you perform the main cleaning of your hot tub, pour in the Spa System Flush through the filter area of your hot tub. Turn on all the jets on your hot tub all the way up and allow them to run for 15 to 30 minutes. Rotate the large diverter levers through each of their positions during this process to be sure the system flush has a chance to reach all the jet lines. After you have run your jets for 15 to 30 minutes, turn them off and close the lid of your hot tub to allow the water in your hot tub to circulate overnight. The next day, remove the cover to your hot tub and drain all the water from it. Using rubber gloves and some of the Spa System Flush, you can wipe down the shell to remove any scum or film that has developed along the sides. Remove the filters from your hot tub and clean them or replace them. Now that you have cleaned your hot tub both inside and out, it is time to refill the water. Once you have refilled the water, balance the water and treat it with the proper chemicals to be sure the water stays clean and clear. Everyone deserves the feeling of soaking in the warm water of a hot tub that has been properly cleaned both inside and out. While your hot tub will give you warning signs, you should still give it a good deep cleaning at least once a year to make sure your hot tub is free from all dirty, grime, grease and bacteria so you can provide your bathers with a clean and fresh environment that is perfecting for relaxing and relieving stress. 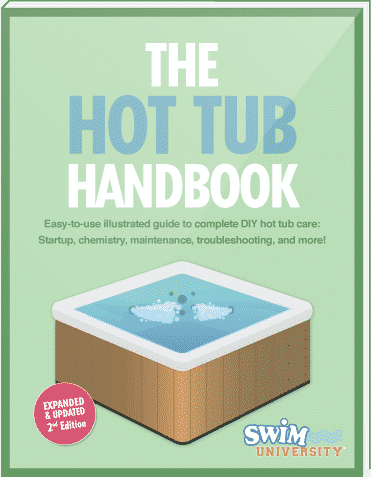 How Does a Hot Tub’s Filtration System Work? Do you know how your hot tub's filtration system works? Let's take a look at what makes up the system and how it functions to clean your water.